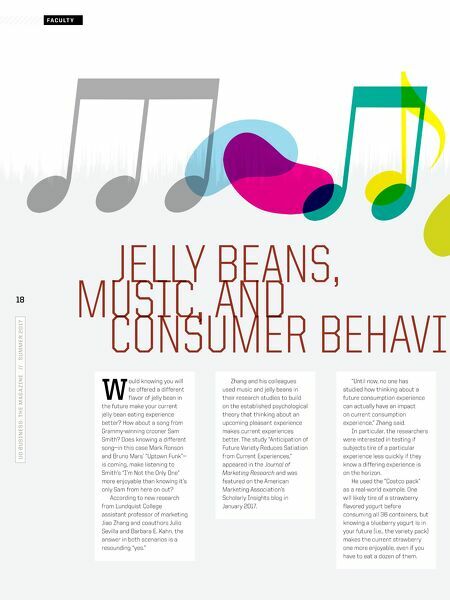 CONSUMER BEHAVI JELLY BEANS, MUSIC, AND S E C T I O N 18 UO BUS I NE S S : T HE M A G A Z I NE // SUMMER 2 0 17 F A C U LT Y W ould knowing you will be offered a different flavor of jelly bean in the future make your current jelly bean eating experience better? How about a song from Grammy-winning crooner Sam Smith? Does knowing a different song—in this case Mark Ronson and Bruno Mars' "Uptown Funk"— is coming, make listening to Smith's "I'm Not the Only One" more enjoyable than knowing it's only Sam from here on out? According to new research from Lundquist College assistant professor of marketing Jiao Zhang and coauthors Julio Sevilla and Barbara E. Kahn, the answer in both scenarios is a resounding "yes." 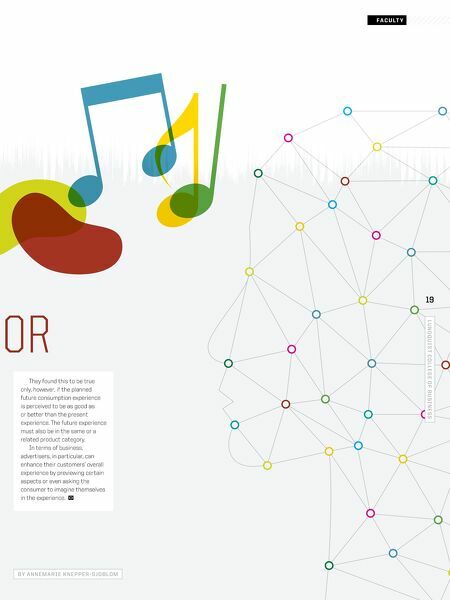 Zhang and his colleagues used music and jelly beans in their research studies to build on the established psychological theory that thinking about an upcoming pleasant experience makes current experiences better. The study "Anticipation of Future Variety Reduces Satiation from Current Experiences," appeared in the Journal of Marketing Research and was featured on the American Marketing Association's Scholarly Insights blog in January 2017. "Until now, no one has studied how thinking about a future consumption experience can actually have an impact on current consumption experience," Zhang said. In particular, the researchers were interested in testing if subjects tire of a particular experience less quickly if they know a differing experience is on the horizon. He used the "Costco pack" as a real-world example. One will likely tire of a strawberry flavored yogurt before consuming all 36 containers, but knowing a blueberry yogurt is in your future (i.e., the variety pack) makes the current strawberry one more enjoyable, even if you have to eat a dozen of them.